After a sad farewell to our Casa hosts Anna-Maria and Victor, we navigated our way out of Havana heading west for Vinales. Four days on the road included a visit to Les Terraces, a small resort community surrounded by thriving Pine forests (a regeneration project for an area scarred by fire and agricultural mishaps) and a beautiful series of swimming pools at nearby Banos del San Juan. There was a bit of backtracking on this part of our journey, here at Les Terraces because our minimal Spanish had us standing at the gate for the banos with the wrong entry ticket. This meant dropping the trailer and riding back to the park entrance gate for the correct ticket, tacking an extra 15k on the day. There is a cool little restaurant in the village (El Romero) that served up dishes with local ingredients, whole grains and some tasty baked rolls, a nice change from the standard rice and beans. A night in the tent beside a sweet river and a gorgeous ride the following day had us arriving in Las Palmas. Upon the realization that an important article had been left behind in the restaurant mentioned above, we tried to figure out the best way to backtrack for the second time in as many days. Thankfully some very friendly and helpful Cubans were on hand, and the next day Hailey got a lift to retrieve it. Vinales is close enough to Las Palmas that we decided to head out that same day, and the late afternoon and evening light illuminated some of the most stunning scenery we had seen so far. 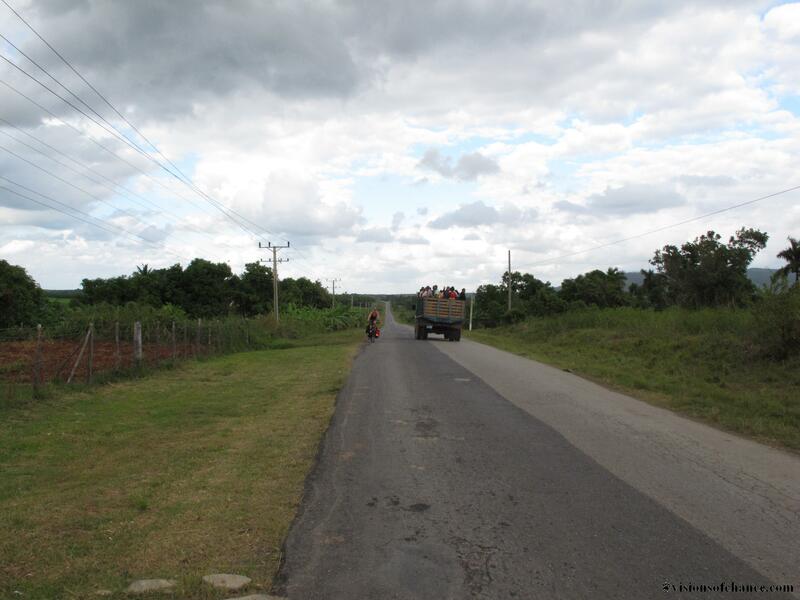 Riding past big , untouched limestone mogotes. 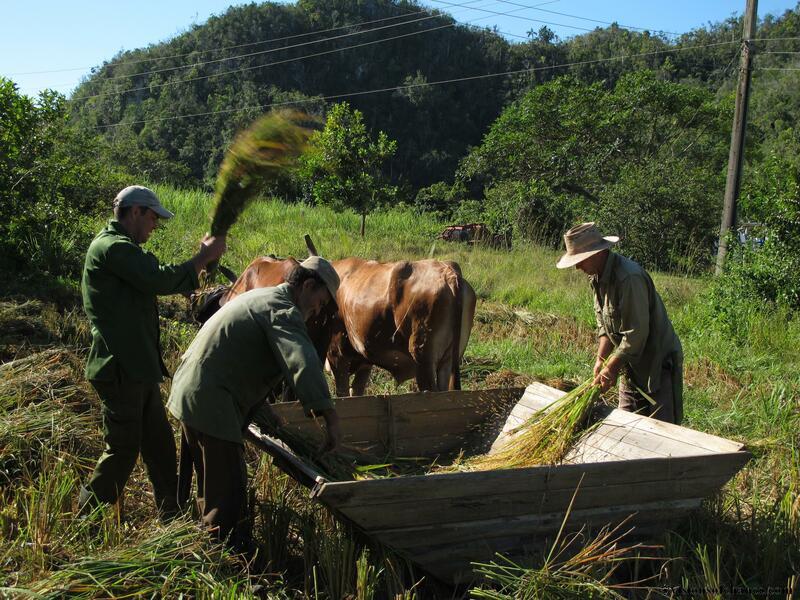 The days of Soviet built tractors and abundant fuel to power them are long gone, and this is a common scene in the Vinales valley. We rolled into Vinales after the sun had dipped below the horizon, and our fully loaded bikes had the Casa hustlers (jinteros/as) calling out from all sides. We had a Casa in mind, recommended by a friend, and found our way to it. Booked up, unfortunately, but we were quickly directed around the corner to Casa Mileidy. A real score, it turned out! That evening, despite profuse apologies for being unprepared, we were served up a HUGE and delicious meal by our hosts. Garlic fried chicken with yucca, fried plantain chips, papas fritas, black bean soup, avocado, rice, vegetables, and for dessert: cheese and guava paste! I guess wheels are hard to come by here. The view from Casa Mileidy. 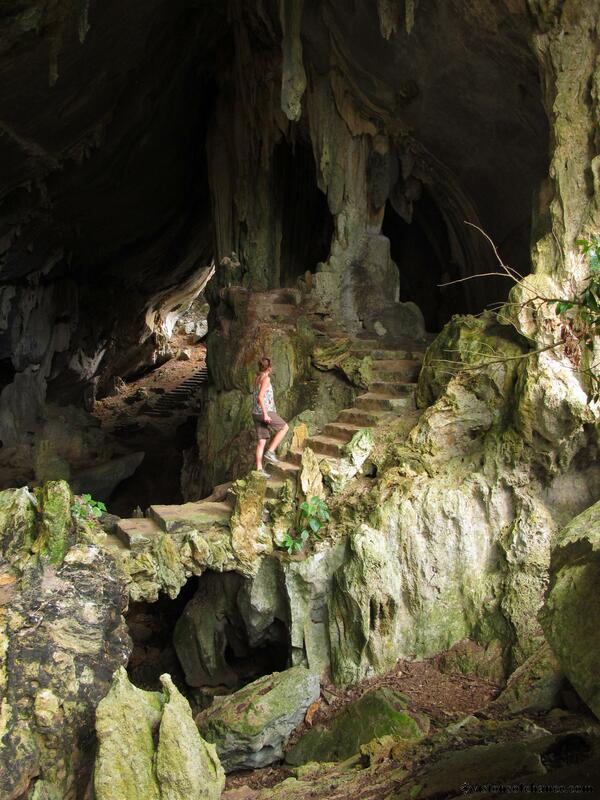 By the light of next day we realized that Casa Mileidy was on the very edge of town, away from the hustle and bustle, and literally ten minutes walk away from some of the best crags around! 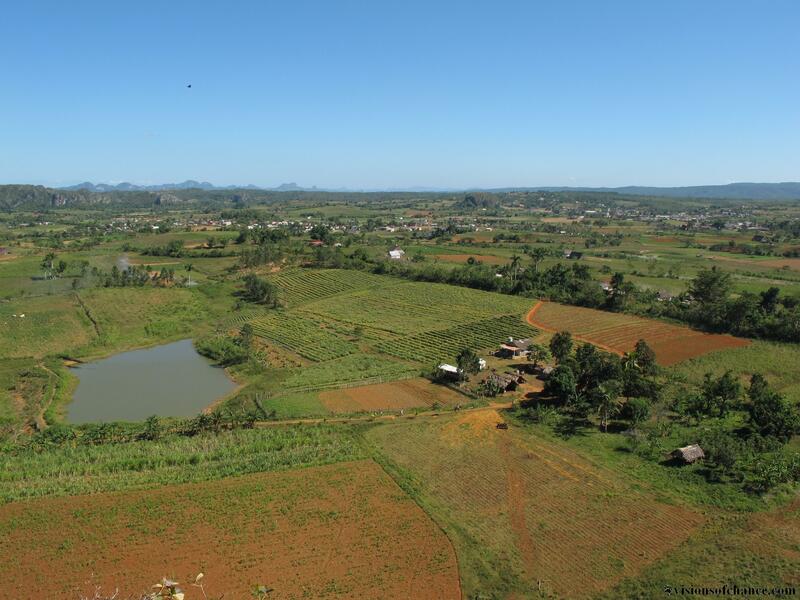 This, combined with the amiable nature of Mileidy and her family made the decision to stay right here an easy one. After an equally large breakfast accompanied by coffee grown and roasted right in the back yard, we headed out to the rock. 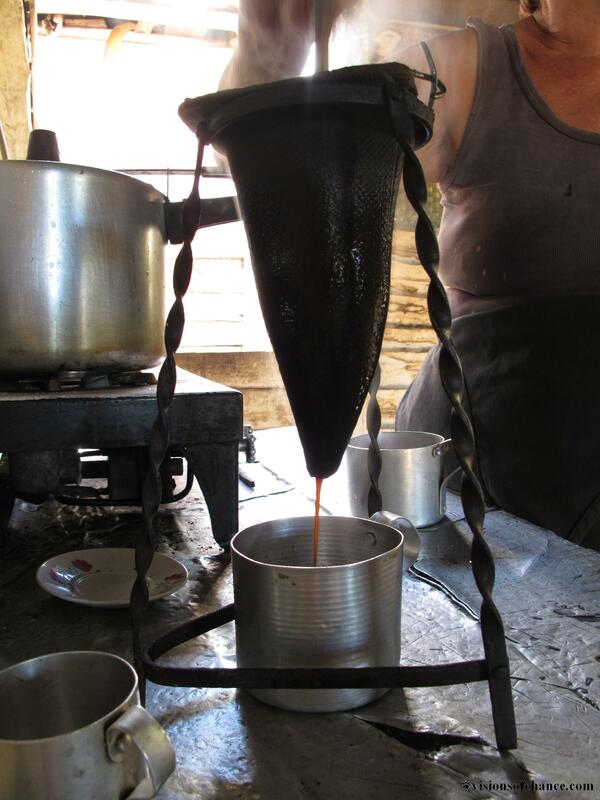 Carlo tends to hand-picked coffee pods drying in the sun. We met some members of the small Cuban climbing community, and it is shocking and unfair that their choice to pursue the sport could land them in serious hot water with the government. 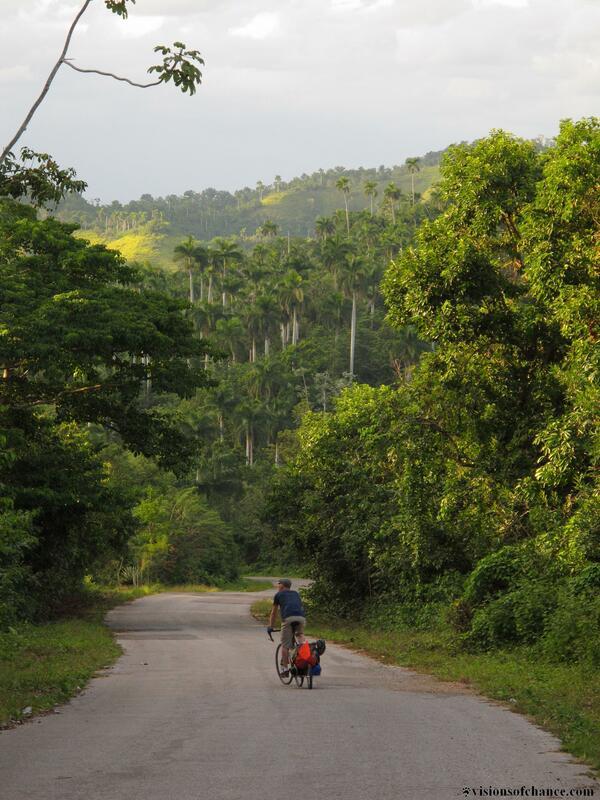 Despite it being “illegal” for Cuban nationals to climb on the crags surrounding Vinales, there are some young guns that climb at a very high level. 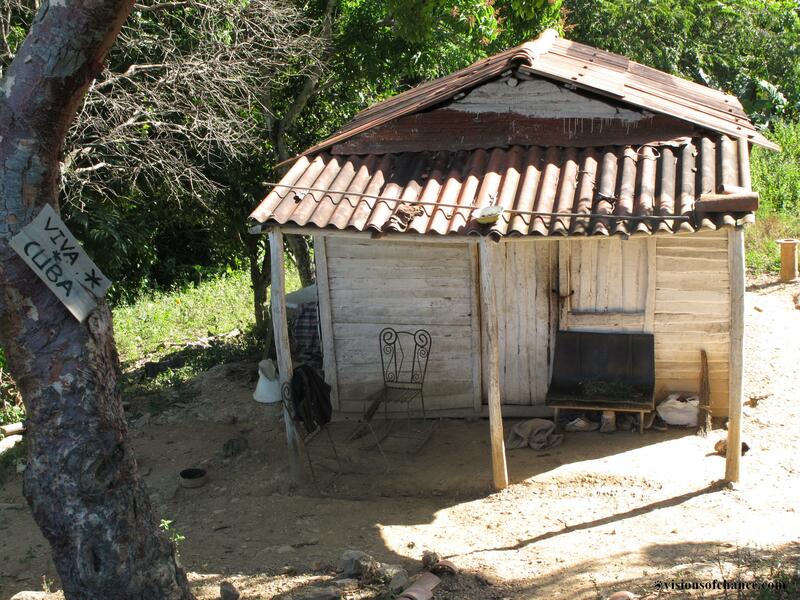 If you decide to enjoy a climbing holiday in Cuba, consider leaving some gear behind to help these guys out. Hangers and bolts are very much in demand, there is miles of new route potential! I cannot say enough about Vinales. Fantastic rock climbing. Eye pleasing vistas in all directions. Friendly vibe, great parties in the plaza, and hundreds of reputable inexpensive Casas serving better food than you will find in any state-run restaurant. The next two weeks went by in a flash, climbing every day, exploring different valleys and mogotes, strolling through fields of coffee, yucca, tobacco and pineapple. We took a couple of days off for a short cycle to San Diego de Los Banos, two days of riding through even more incredible landscapes. The namesake sulphur baths we were looking forward to soaking in turned out to be closed, and had been for a couple of years! This is the hazard of an outdated guidebook. 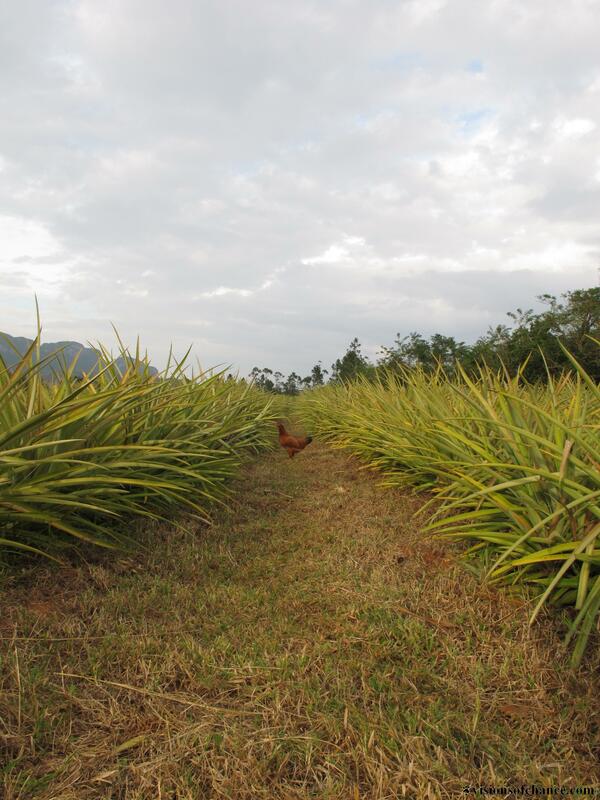 Here are some more images of our time in and around Vinales. 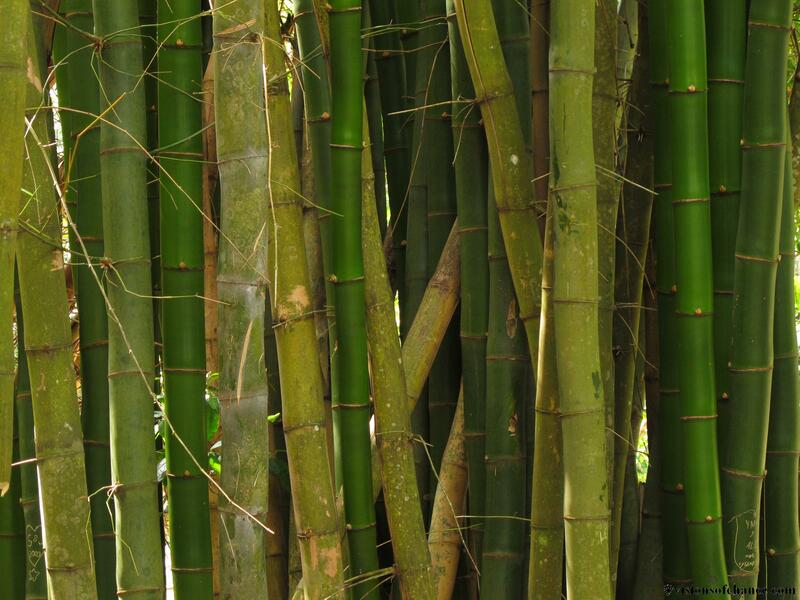 Bamboo stand at Les Terraces. 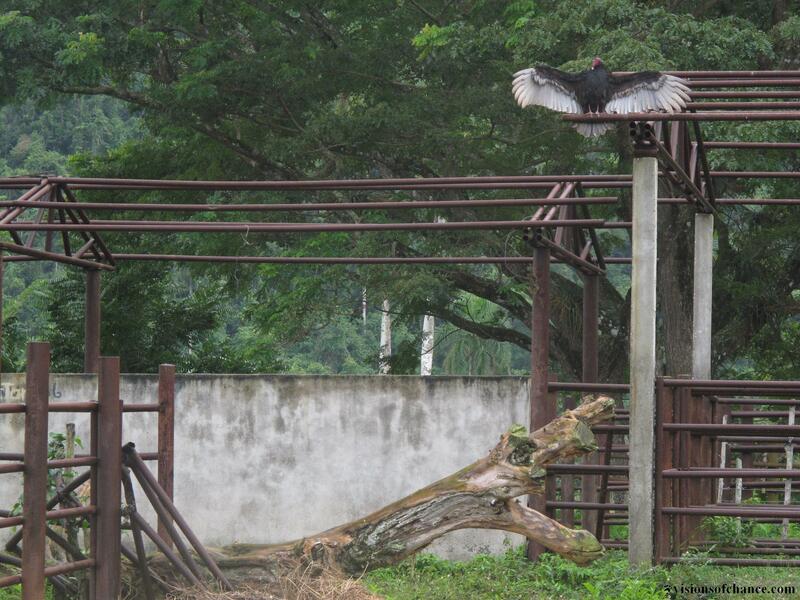 Turkey vulture drying out after a rain shower. Riding towards the coast from Les Terraces. H crossing paths with Cuban public transport: the truck. Rolling past the tobacco fields as we near Vinales. 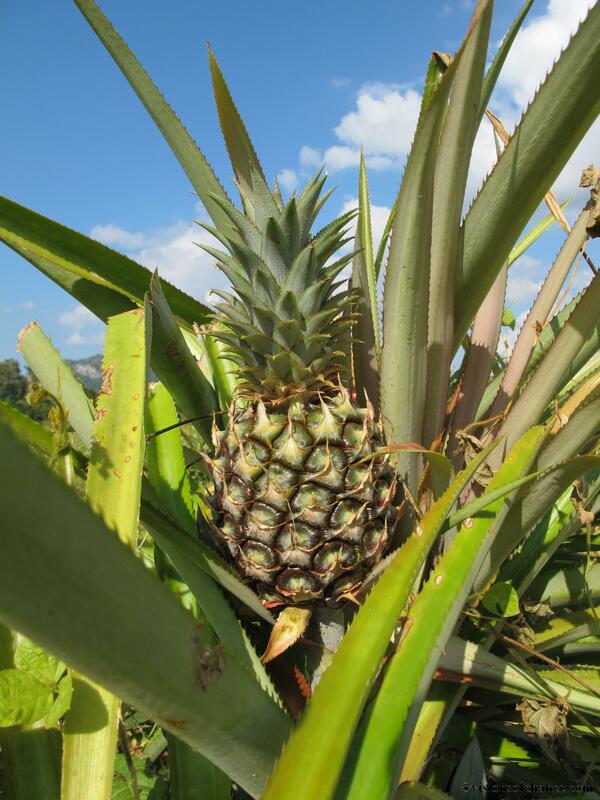 Free rangin’ among the pineapple plants on Raul’s farm. 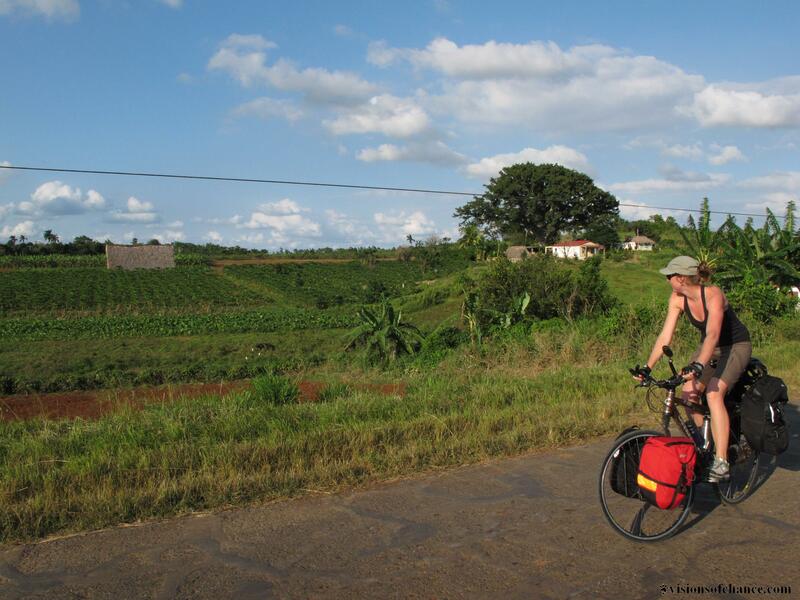 Mmmm, tropical fruit that travels less than a kilometre from field to plate, and that by bicycle! 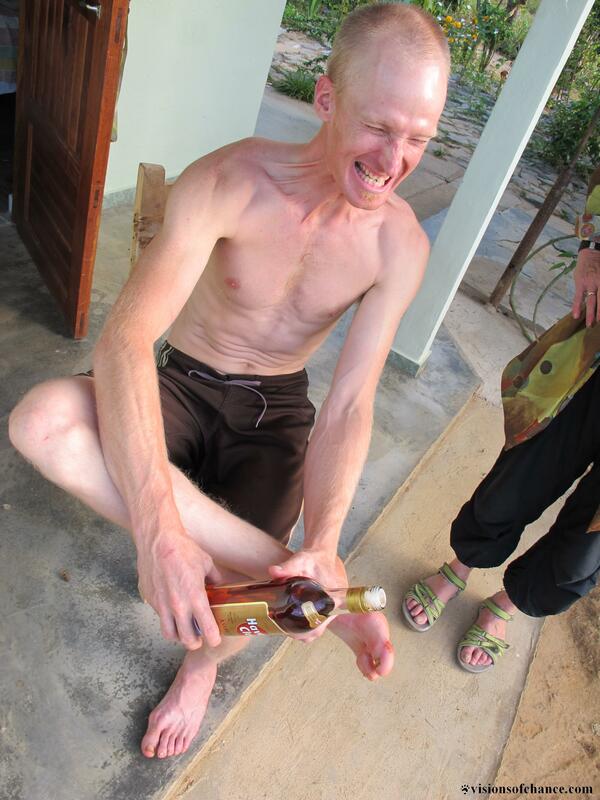 Treating an open wound on my foot with Cuba’s finest, Havana Club. May also be taken internally. Hand threshing a rice crop. Cooling off at the Rio Resvalosa, which translates to slippery river. I think. H in the Cueva de los Portales, Che’s headquarters during the Cuban Missile Crisis. 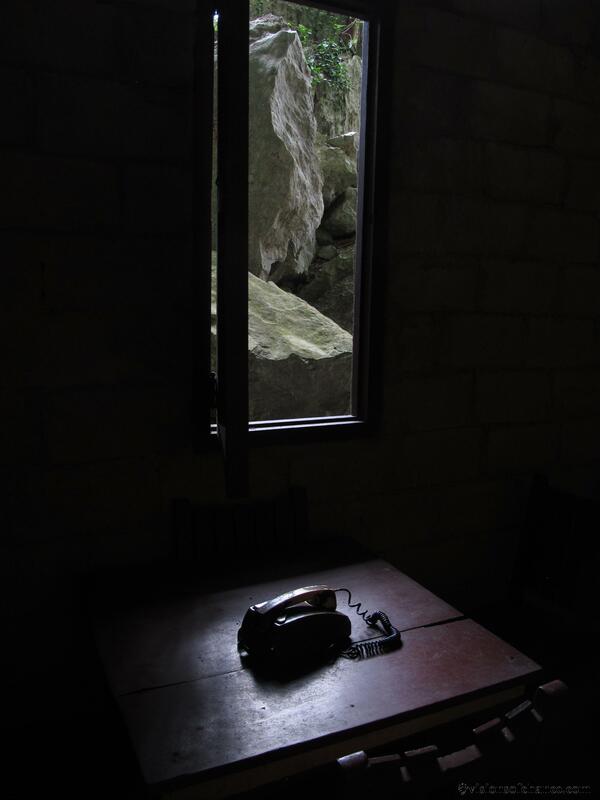 Telephone in Che’s command center in Cuevas de los Portales. 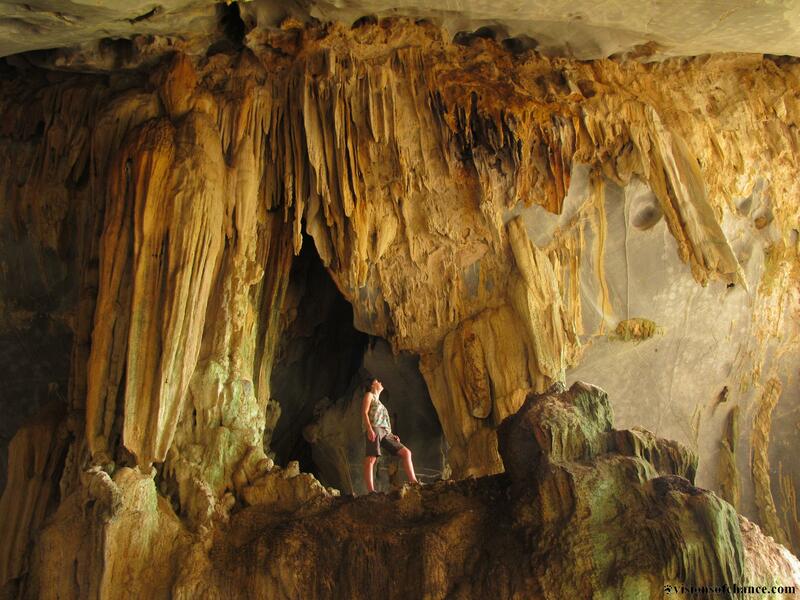 Cueva de los Portale. Other-worldly. I don’t know if the resident of this humble abode posted the sign, but it struck me as evidence of the strong national pride prevalent despite tough living. At least by North American standards. 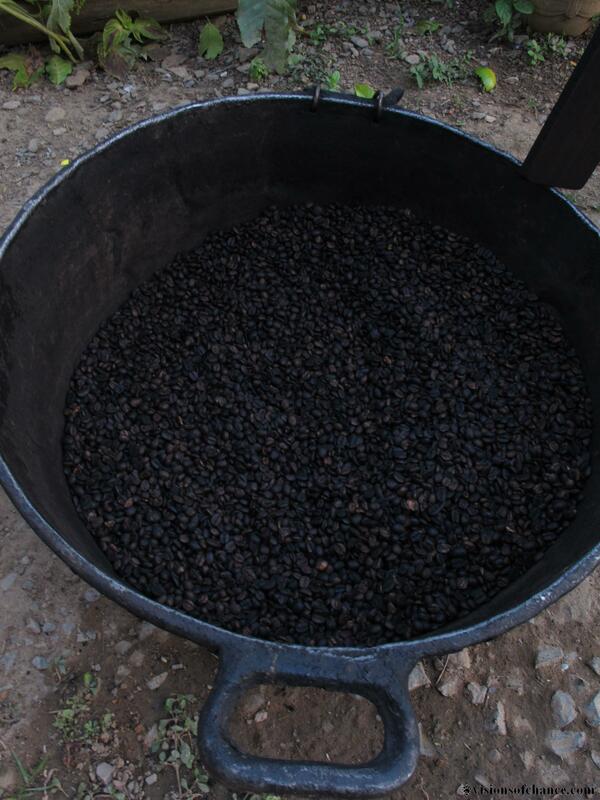 Freshly roasted coffee beans at Casa Mileidy. 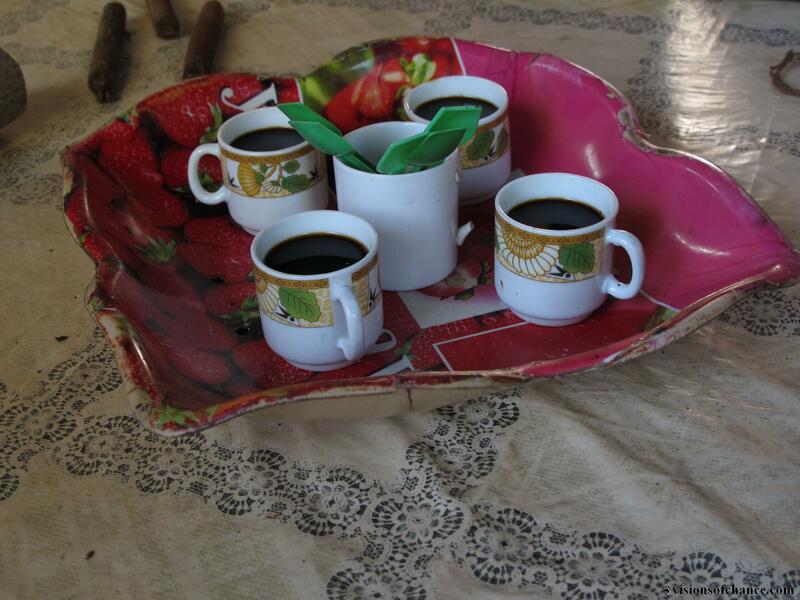 Coffee is a big part of Cuban culture, served strong, black and sweet. Mmmm. 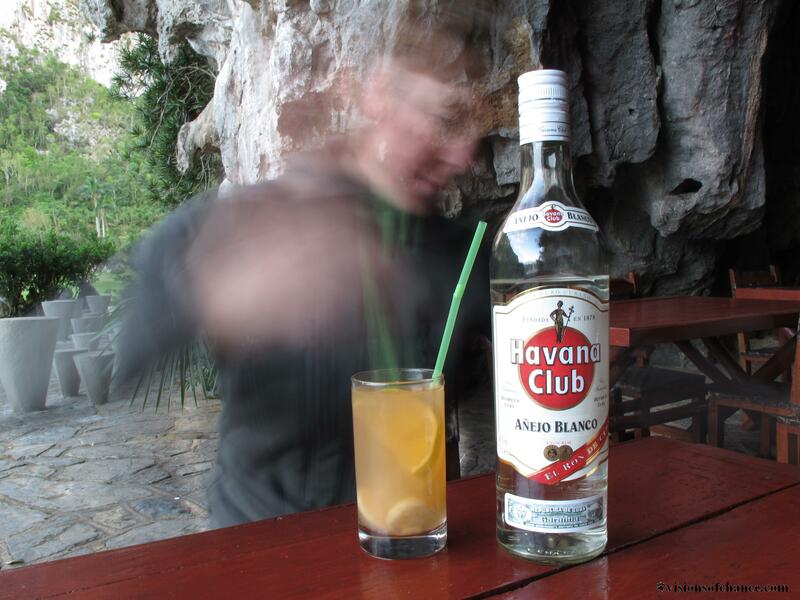 H mixin’ it up at the Palanque Bar/Disco, metres away from a couple of crags, and well worth a visit. 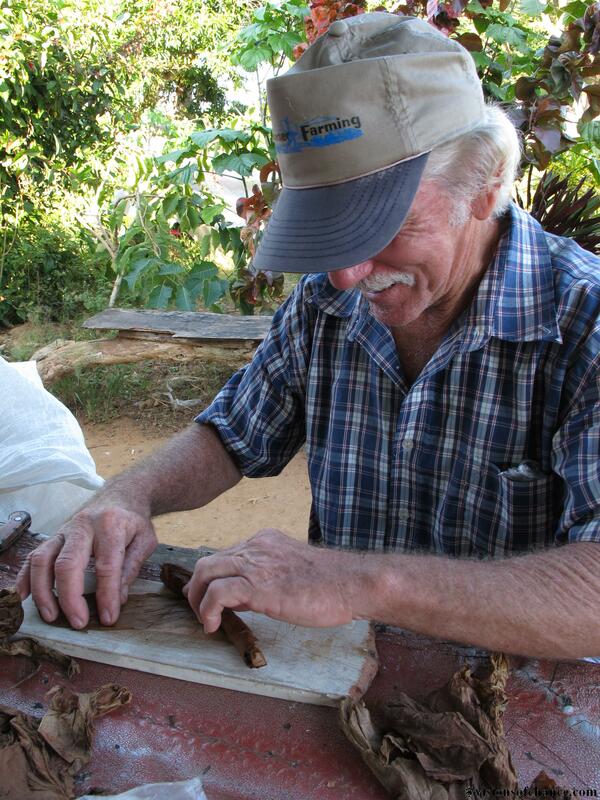 Fernando hand rolling a Cuban cigar. 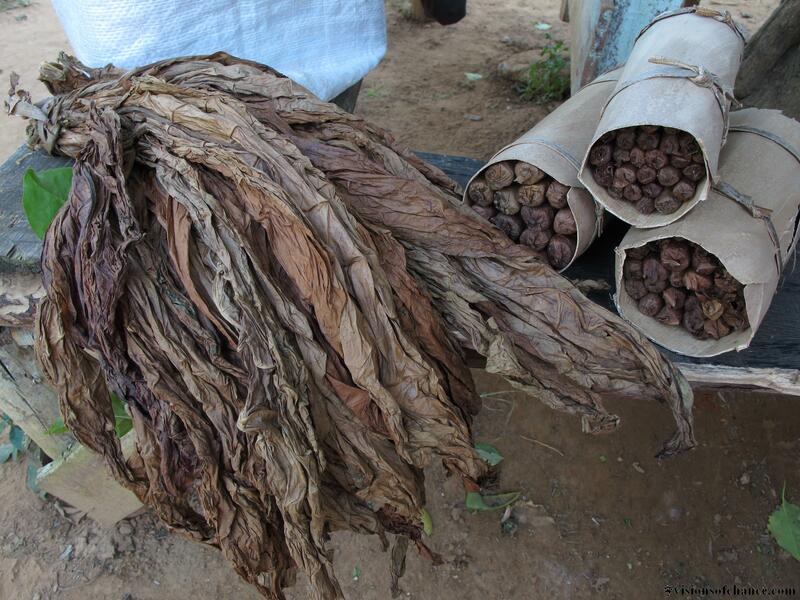 The cured tobacco leaf and the final product. 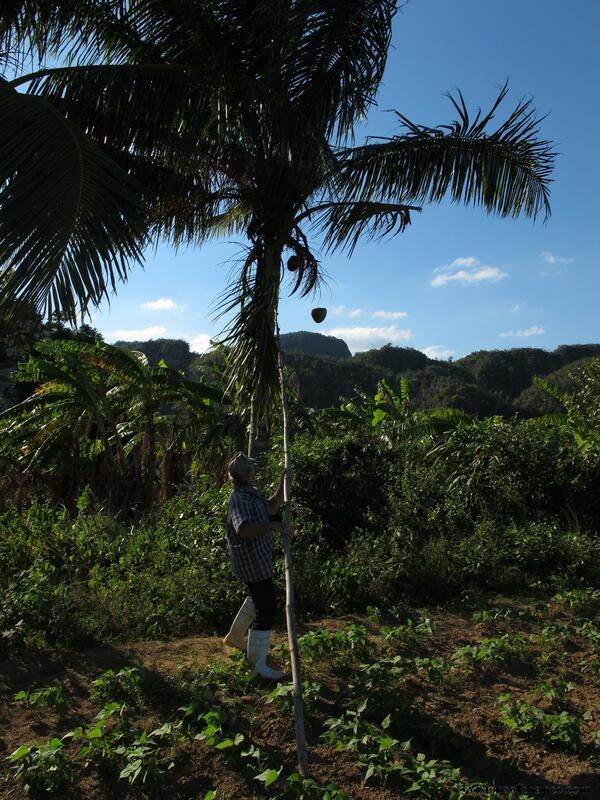 Vinales is home of Cuba’s finest tobacco crops. The view of Valle Vinales over Raul’s farm from the top of a stellar route called Mas Tarde. 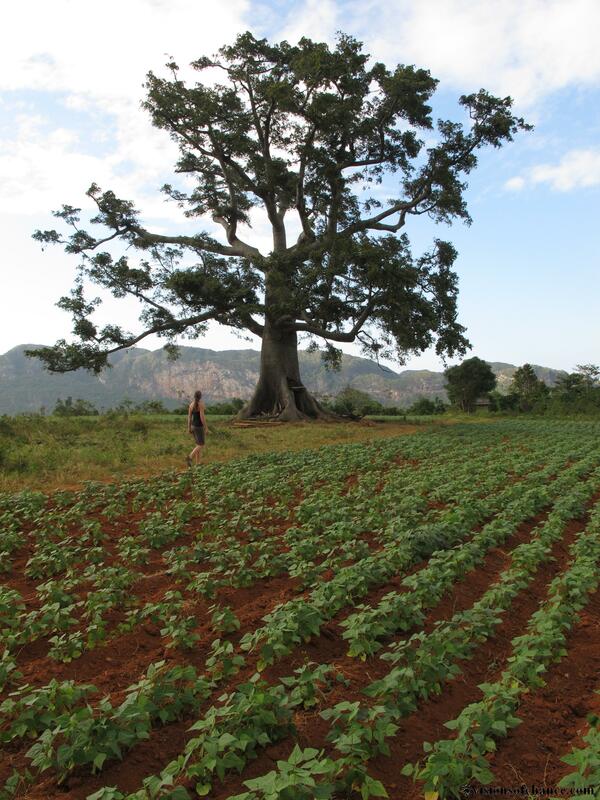 A giant tree standing alone in the fields of a peaceful valley tucked behind the Mogote del Valle. 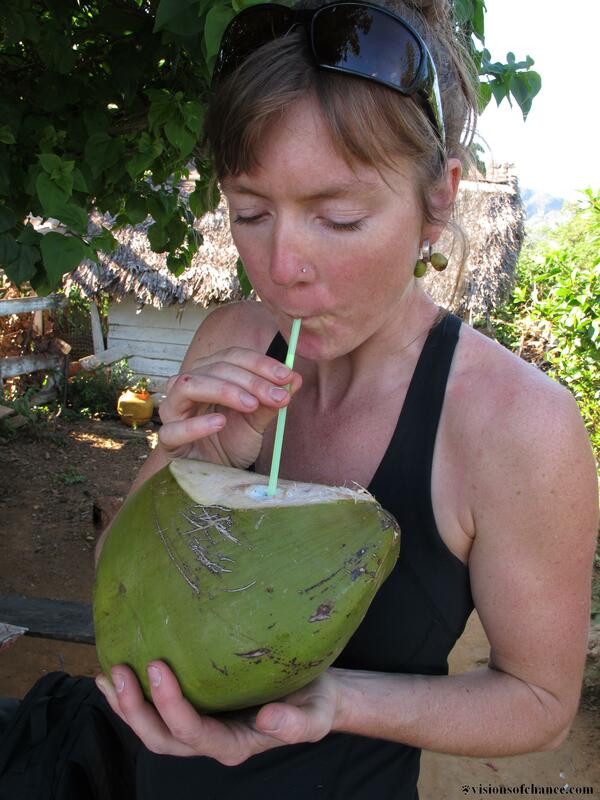 H enjoying one of her favorite treats, fresh coconut water. Renan Ozturk has been creating beautiful videos that he posts on the collective blog Vertical Carnival Dispatches, and lately this includes three dispatches from a recent climbing trip to Vinales. Great stuff, brings back good memories, and I even recognize a few faces! Here is the second episode, be sure to check out the first and third here.